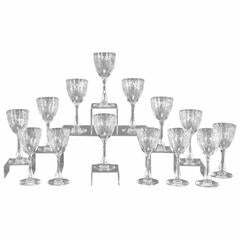 One the most dramatic and elegant patterns, this set of 12 Webb goblets will create a one of a kind table setting. 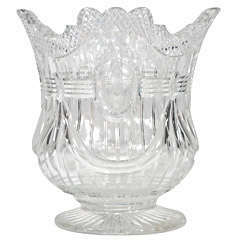 Standing 9 3/8" tall, these goblets are all hand blown crystal, embellished with intricately engraved decoration. The bowls are large enough to hold a glassful of your favorite wine and measure 3 1/2" in diameter, perched atop a spiral twist stem. The foot provides a low center of gravity and stable base which is also engraved to match. These are a joy to hold and sure to delight friends and family! Vintage 1960s set of 8 twisted stem tall clear glass wine stems. No maker's mark. Vintage 1960s set of 10 twisted stem glass coupes. No maker's mark.